Make sure you go an visit Darley's Restaurant at Lilianfels Resort & Spa - The award winning hatted blue mountains restaurant. The Autumn months bring crisper temperatures, vibrant colours and plenty of reasons to plan a Blue Mountains getaway. From art exhibitions to foodie trails and more, here are a few must-see attractions that are sure to delight during your next visit. The Blue Mountains attracts art lovers from far and wide for its array of galleries, craft markets and exhibitions led by world class artists. Visitors can take in the region’s cultural diversity over a day of gallery hopping, or visit the world-renowned Sculpture at Scenic World exhibition which runs from April 7 – May 7, 2017. The annual exhibition explores the boundaries of art and nature, exhibiting over 30 unique sculptures in a natural jurassic rainforest. Featuring a public program and guided tours led by talented local artists, art lovers can view artworks displayed along the 2.4-kilometre Scenic Walkway and enjoy unlimited rides on the Scenic Railway, Skyway and Cableway. Other opportunities to explore the diverse array of works include Sculpture Otherwise – an indoor art exhibition at the Blue Mountains Cultural Centre – and an outdoor exhibition of artworks at various locations throughout the upper Mountains. Home to ancient landscapes, stunning waterfalls and endless views, the Blue Mountains is a natural playground for outdoor enthusiasts. Scenic World is a great starting point for visitors who want to explore the world heritage-listed Blue Mountains National Park, with free all-day parking and easy access to a range of local activities. From Scenic World, visitors can take the Skyway across the valley and enjoy the leisurely Prince Henry Cliff Walk which stretches around to the top of the picturesque Katoomba Falls. Take in spectacular views of the Jamison Valley as you meander along the escarpment which leads down to the iconic Three Sisters. From here, you can take the Giant Staircase which winds alongside the Three Sisters to the Jamison Valley floor, or follow the Federal Pass through the rainforest to the base of Katoomba Falls. 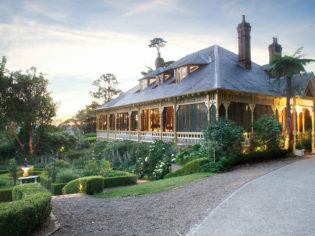 From here, you can get your heart pumping and climb the Furber Steps, or take the Scenic Railway to the top. It takes around two hours from start to finish, but you may want to allow more time to take in the spectacular views along the way. With so many dining options on offer within easy walking distance, it’s a real feat to narrow the selection down to just a few. Enjoy sky high dining at EATS270 – perched 270 metres above the Jamison Valley – and treat your taste buds to diverse lunch menus. For something on the lighter side, the Terrace Café also offers a range of specialty teas and delicious bakery treats, along with one of the best vantage points of the Three Sisters, Mt Solitary and the vast Jamison Valley. Katoomba and Leura boast a range of award winning restaurants, offering cuisines from right across the globe, and nearby Blackheath is home to a range of quaint cafes and restaurants catering to all budgets. Visitors can also pick up deliciously sweet apple pies and fresh juice and jams at the Logan Brae Orchard, and enjoy stunning views of the Kanimbla Valley and Mount Blackheath. From breath taking landscapes to the thrill of the Scenic Railway, Scenic World has something for everyone this Autumn. Charge down a cliff on the world’s steepest incline railway, glide between cliff tops on the glass-floored Skyway, journey by Cableway to the valley floor, or be enveloped by the rainforest canopy along our 2.4 km boardwalk. Scenic World is renowned for providing the ultimate Blue Mountains adventure – from native birdlife and fresh air, to breath taking views of the Three Sisters, Katoomba Falls & the Jamison Valley. Make a day of it with unlimited passes, lunch outdoors on the EATS270 balcony, souvenir shopping and free on-site parking. Located within minutes of Katoomba, and close to the accommodation, bushwalking, shopping and restaurants of Leura and Blackheath, Scenic World is central to any Blue Mountains getaway.